I fell into the trap of being idle – which is worse, but not by much, than falling into the trap of being too busy. My husband had the opportunity to call me out on my idleness, although he wisely chose not to take that opportunity. Still, I had to recover from my idleness – or my idolness as my husband DID point out. The good news is that when I took that first step, each step became a little easier. At the end of the day, I discovered that I can accomplish more if I get started then I will ever get done just sitting there planning. I also discovered that if I get to doing then the rest of my family follows suit. Maybe they do something different than I desired, but they are doing and that is worth something. 1. Start and start now. 2. Take the big and break it down into smaller steps. 3. Develop the right motivation. 4. Stop waiting for others to do what needs to be done. 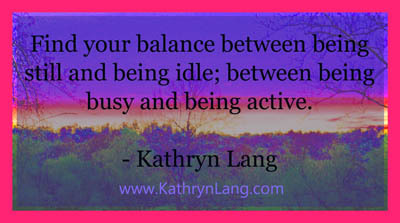 You can be still and not be idle. You can be active and not busy. It comes down to choices – and I today, for this moment, I am choosing the better.